I was initially delighted by Challenge of Nexar due to it's first-person point of view. I loved space shooters and particular the feeling of sitting in the cockpit that came with games like this and StarMaster. It gave me a sense of being in the action rather than a viewer. Horizontal shooters are fun, but they are also plentiful. This perspective was more rare in game play. However, the game play had an odd progression. 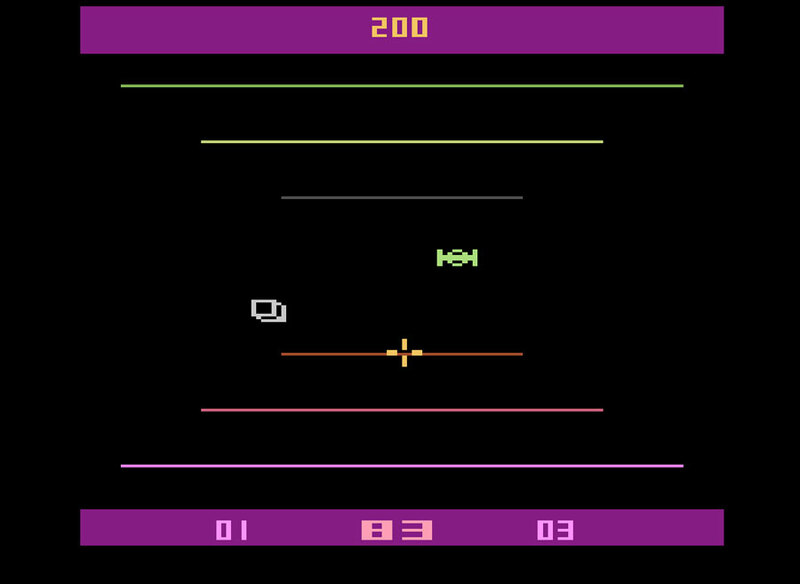 Using the joystick to aim your weapon via on-screen crosshairs, you target and kill the enemy saucers. The challenge came as the action sped up and your controls seemed less responsive. 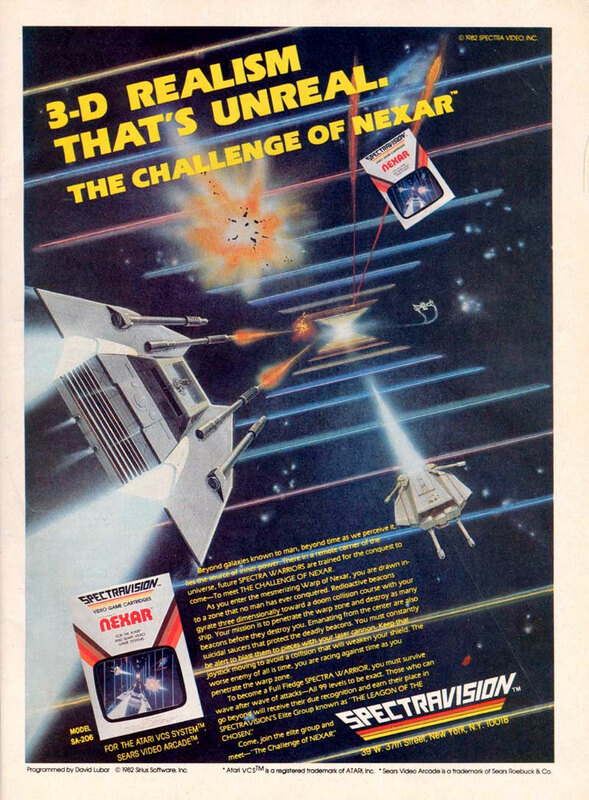 There isn't much of a story to Challenge of Nexar which is a shame due to it's interesting title. One would think such a title would have a cool backstory even if it was just a blip in the developer's mind at the time. As a kid I loved the depth perception the game offered via it's parallel lines and saucers and beacons appearing within it. You begin with 3 or 5 shields depending on your difficulty switch settings. 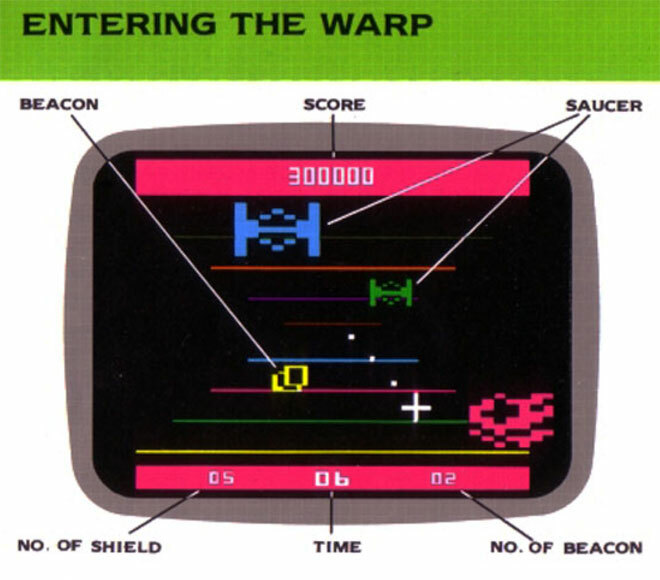 It's a single-player "shoot at everything" type of game where focusing on the beacons is what will clear the levels and let you advance before the timer runs out. Challenge of Nexar in order to fix a bug where a rollover from 99 shields would reset the count to zero. There are 3 game variations consisting of 2 levels of practice (regular & advanced) and the game itself. If you remain stationary, you'll be a goner. You have to be on the move and honing in on enemies, while avoiding collisions. An on-screen indicator tells you how many beacons remain as well as how many shields you have. Don't for get to keep an eye on your time as well. The saucers travel at eight different speeds, letting you garner more points with each increase in speed. That can be the difference between getting only 25 points for a kill versus 2,000! Although Challenge of Nexar has 99 levels, you'll likely punch your TV before getting that far. My main complaint is with the balance between increased difficulty and blatant insanity. The gradient is steep in this regard. The difficulty switches are well implemented and my favorite aspect of this game. They determine how many shields (lives) you begin with and the outcome of running down the timer. One advantage to placing these functions on the switches would ordinarily be to compensate for players with different skill levels. 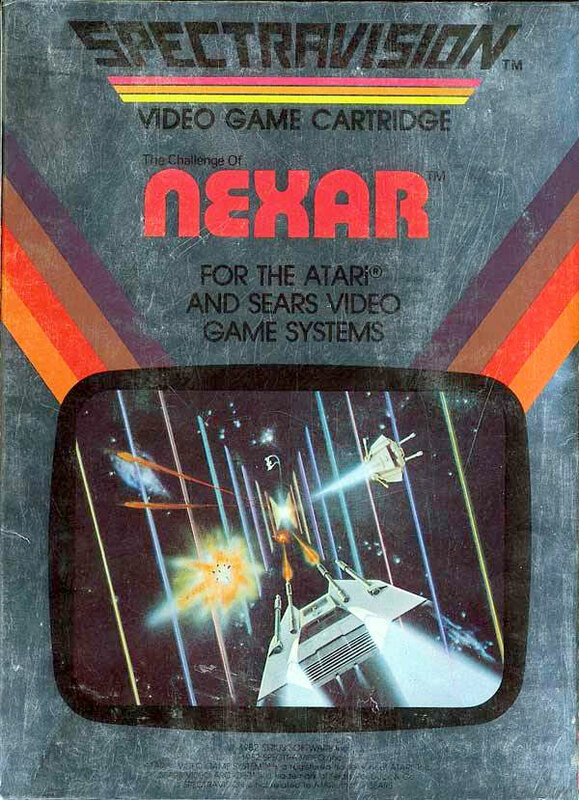 However, Nexar is a single player game. The Left Difficulty Switch toggles between 5 shields and 3 shields. The right difficulty Switch determines whether you lose a life or end the game when the timer reaches zero. Interesting options! has a first-person viewpoint which is fairly well done and offers some manic game play. It's downside is that it gets ridiculously hard by nature of the controls feeling spongy as you progress in levels.